Tiddles is a suave, carefree kitty cat whose only pleasures in life are eating mice, wooing the ladies, and being generally apathetic toward his owner, Jake. But when a toxic spill occurs outside of town, Tiddles finds himself savagely attacked by a nasty-looking radioactive field mouse, and he wakes up as one of the undead. However, he still retains a bit of compassion and refrains for now from zombie Bacchanalian delights, such as eating living beings brains Umm . . . any brains at all However, Tiddles, a.k.a. Zombie Cat, is decomposing rapidly and would prefer to live a normal life in the zombie apocalypse with his owner, Jake. But will Jake take in his former cuddly pet or will ZC be doomed to roam the streets trying to avoid the inevitable pull of his undead yearnings? 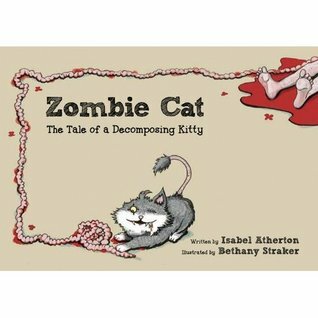 Zombie Cat is a humorous adult picture book in the vein of Pat the Zombie and Ten Little Zombies: A Love Story. Isabel Atherton ‘s quirky storytelling combined with Bethany Straker ‘s captivating (and slightly grotesque ) illustrations make this the perfect addition to any Halloween collection. It ‘s the ideal gift for any crazed zombie fanatic or equally crazed cat lover. Zombies. Cats. Fun picture book. You know Lady Ozma just had to pick this one up. It was like a moral imperative. Who normally gets left out of all our fave zombie tales? The pets. Why no pet love? What about Lassie? Tweety Bird? Or in this case, Tiddles the Cat? Do zombies eat their pets after munching on the brains of their family? Does whatever caused the zombie apocalypse cross species? Or maybe that should be: Demented minds want to know. Shut up. We already know that Lady Ozma is slightly demented. Read the Review on Page 2.